Somehow when you hear the tranquil Green Sleeves playing while perched on the high top table, you know Pho Vistro does things differently. The dining room is a step up from the no-frills sparse tables where the condiments are centerpieces. Their menu to the point; there’s no spiraling notebook where the combination of proteins and offal is dizzying. 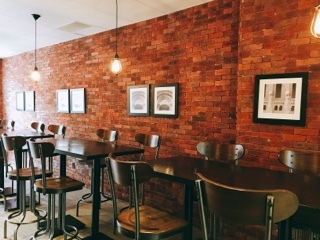 Pho Vistro focuses on pho – chicken, beef or vegan – either served in soup or dried form. 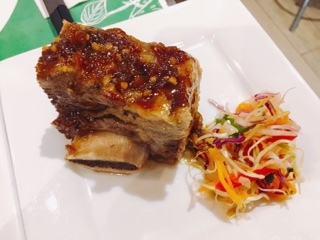 There are also a few appetizers: the Vietnamese-style ribs ($6) arrives in singular form - a huge hunk of beef glazed with sweet hoisin that's tender with a bit of bite. It's just difficult to share so get one for yourself. Their lunch special ($12) is a decent portion, consisting of a bowl of pho and spring roll (or and imperial roll for a healthier non-fried version). 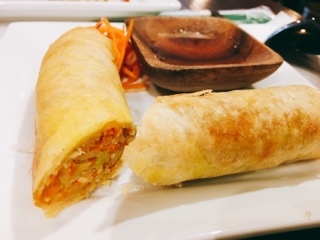 Unlike other restaurants that relies heavily on mung bean noodles or yellow beans, Pho Vistro’s roll contains plenty of finely slivered vegetables so you taste more than just crisp dough and starch. 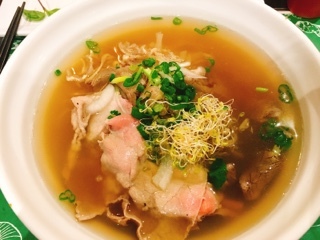 Their soup contains no MSG and instead relies on boiling bones and herbs for over a day to develop its flavour. On the first sip, I could taste the difference – the broth seemed bland, but the flavours slowly built on the tongue. It’s atypical since the soup relies more on spices than salt. Without the MSG, many reviewers claim they weren’t thirsty afterwards; maybe it's the hoisin or sriracha, but I still downed a full bottle. The noodles are cooked well, but the portion really skimpy. Typically, I order a small bowl at other restaurants and even I was left wanting more (extra noodles is definitely required). Their beef arrives in large thin slices and was really lean and healthy. 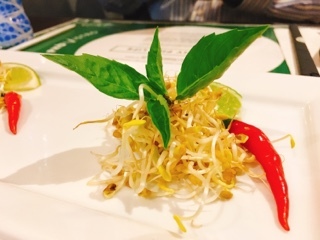 However, the organic bean sprouts takes some getting used to as they’re rather shriveled and the concentrated flavour tastes similar to alfalfa sprout. I appreciate the healthy spin of Pho Vistro, but admittedly miss the fulsome rich salty beefiness of traditional pho. It’s good, just different. Let the evolution begin.